AHIA names Executive Director - Rachel Rettberg. We were proud co-recipients of the 2018 Lemonaid stand fundraiser! $17,000 was presented to A House in Austin for the renovation project for the home. In August 2017, we secured a new rental space for programming at Original Providence Baptist Church at 515 N. Pine Avenue--one house away from our AHIA house. We'll be on the same street where our permanent home is located to serve families on the block and in all of Austin. This new space allows us to offer more classes and to have a permanent classroom set-up for more creative play and experiences for families. In April 2017, we received our determination letter and became an officially recognized 501(c)3 organization. Our first free community event at the Austin library was featured in the news. Read the articles here. For all three events, we had close to 40 participants each month which is double the usual participation rate at the library for similar events. 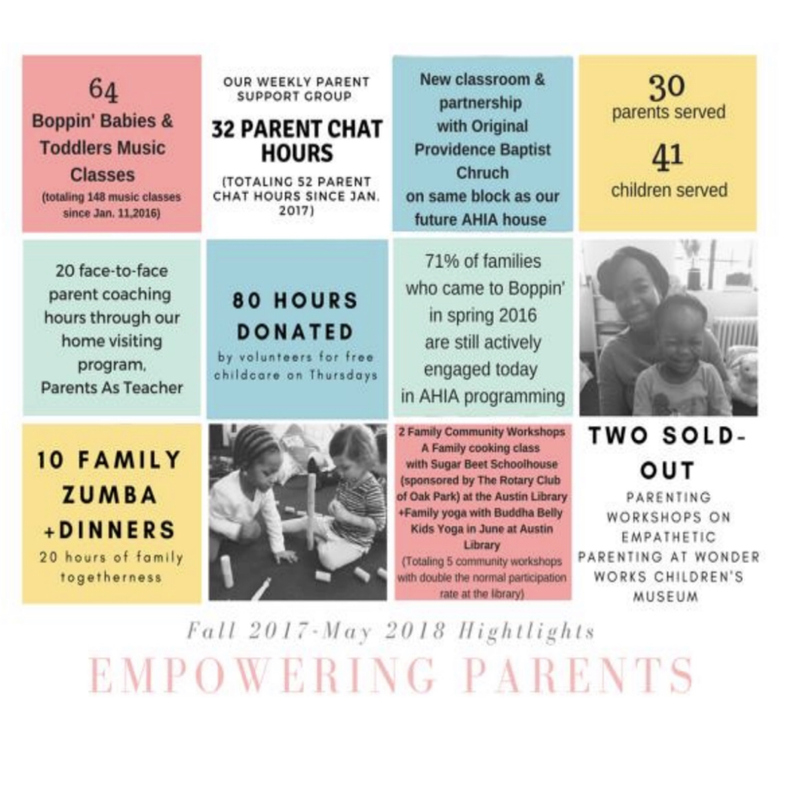 we held 45 Boppin' Babies & Toddlers Music Classes. From one class per week to two per week! You believe in us and are making it all possible! Thank you for all of your love, support, and donations this past year.